Hi! My name is Lindsey Lindsday Lynsay Lyndsey Lyndsay Lynsey. One of the funniest parts of my Party Plan Business came every Monday morning when I went to make my bank deposits, and we would see just how many variations of “Lynsey” would be on the checks I had received from my party guests. Growing up with a uniquely spelled name has made for many humorous moments – and some disappointments. Like when all of your friends find cool name jewelry and naturally they do not have one spelled your way. Welcome to Initial Outfitters! A home party direct sales company that specializes in personalization. Our line of products features jewelry, soap, embroidered towels and handbags, and home decor items. Carole Bloch, Independent Consultant for Initial Outfitters sent me two items for the Diva Holiday Gift Guide – and I struggle with picking which one is my favorite. The bath wrap is perfect for keeping covered while I do my hair and makeup while leaving my neck and arms free. 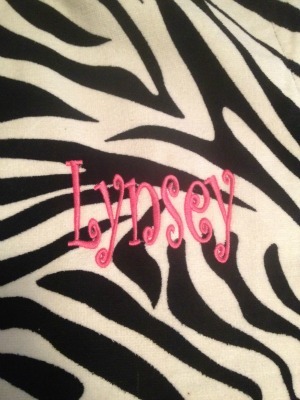 Then add in that is has my name – spelled correctly – embroidered in it… and you have the absolute perfect gift! 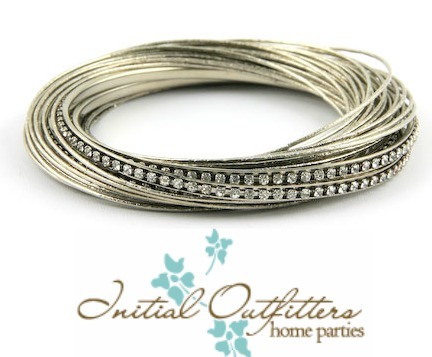 The second item Carole sent me is the 33 Strand Silver & Rhinestone 8″ Bangles. I am not much of a bracelet wearer since I am on the computer a lot, but this has become my “go to” piece every time I leave the house. It is way more brilliant and sparkly than any picture will give it credit for, and makes a nice little jingle when you wear it. I often catch myself absentmindedly playing with it in meetings and out shopping. The bracelet goes with anything and can easily be dressed up or dressed down for whatever occasion. This is a great gift for any woman on your shopping list – and at $22 I think it would be a great Secret Santa gift as well!